I work as an English teacher in a village school and am always in a relentless search for non-traditional methods to help children learn. In this context I came across and started practising play of painting. 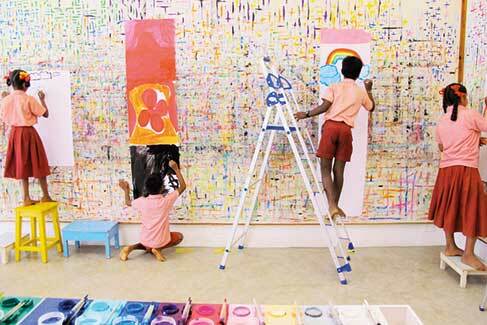 Play of painting is a pedagogical activity developed by Arno Stern that occurs in a special set of conditions. It is conducted in a closed space where the participants stand in front of a white sheet of paper, on which they can paint. There are basic rules pertaining to the use of paints and other materials but total freedom to paint any content. It is a group activity where others paint as well but no discussion or communication about the paintings is allowed among the participants. It is facilitated by a practioner whom Arno Stern calls a ‘servant’. The servant’s task is to serve the painters by ensuring that the materials and conditions for painting are maintained. He/she does not influence the painter or serve as a reference figure in any way. According to Arno Stern, ‘Formulation’ is an important result of this play. Formulation is a repertoire of figures that emerge from the painter; it is NOT art; it is NOT therapy. According to Stern the images are released from a human being’s organic memory by an inner necessity of the individual. At that point, I believe, the children had to commence on their own creative process and each child had to discover his story to tell on the paper in front of him. Rote and exam learning had no place here! AND after initial hesitation, experimentation was on the rise – themes, colours, colour combinations, minute details, brush strokes – everything was explored! The kolum* girls: We had many girls who came from traditional backgrounds, who weren’t given much freedom at home and were raised to be obedient to their parents and future husbands/in-laws. These girls painted kolum after kolum (and flowers) for months on end. A few weeks before the end-of-school session (after 8-9 months of the painting session), I finally saw some gleam of experimentation by these girls. The basic structure of the kolum or flower was there, but there emerged subtle attempts to move to something else (a house, people, a box, etc.). They still held on to the form (of the kolum or flower) which was a safety net for them, but they were taking their first steps to explore other images. It set me wondering: could this openness to new things touch other areas of their life too? After months of repetition, their exploration came in its own time without any initiation from me; the children were following their own inner necessity. In a more traditional class setting I would have been tempted to suggest new forms to paint, but definitely not in the play of painting sessions. The free bird: One 11 year old participant was a typical naughty boy whose favourite activities included falling out of trees and hunting small animals. This little boy was a pack of uncontrollable energy. It always pained me to ask him to concentrate in English class; it seemed to be an artificial imposition on a young bundle of enthusiasm. How do you trap a free bird? I was at my wit’s end trying to figure how to channel his energy. Play of painting was a real nightmare for this boy. To stand for minutes on end in front of a sheet of paper and paint was an impossibility. He could never stand still or even erect. Seeing his restlessness I negotiated to free him whenever he wished to leave during the session. Initially, he stayed only for a few minutes and then left. With time, he began staying longer in the room. He still cannot stay a full hour and his attention is still sporadic, varying with his moods. But, I see concentration and attention growing in him, very slowly. The Achiever: Another student who comes to mind is a 15 year old who could be labelled as a ‘model student’, an all-rounder: good in sports, academics, and extra-curricular activities. He once told me how important it was for him to set goals and succeed. He came conscientiously for the sessions and painted meticulously. Slowly, I could see that there was a growing frustration in him as his artistic skills were not being appreciated or compared with others’. One day, I noticed he started to splash colours on the paper and nothing concrete was painted. This was followed by other similar work. I think this was an important threshold – he seemed to be freeing himself from the chains created by the need for success. The bored girls: I have often felt inadequate as a teacher with two girls who always gave me the impression that they would rather be doing something far more interesting than what I could offer in English class. When they came to the painting sessions, I saw them engrossed and working assiduously. One worked so hard on detailing her sheets. The other explored space and had a pleasure in using as many sheets as possible to complete a single painting. It was a realization for me to note that my lesson plans could not evoke the same preoccupation which I witnessed in the painting room. In regular classes, how often have I found a distance between my constructed aim for the child and his current state of being? How easy it has been for me to label a child as ‘slow’, ‘failure’ or ‘not hardworking’. And yet here was the same child exhibiting all those qualities that I had longed for in the classroom. The difference was that the children had set their own aims and accomplished them in their own way. I was not on a pedestal and not looked up to as a source of knowledge. I was a servant, making sure the pins were in place, the colour pots were filled, colours were mixed when required and water not dripping. To my surprise I enjoyed being at the beck and call of the children. If there was paint dripping, I had to run no matter what I was doing to stop the flow. I had to learn how to multi-task, prepare the paint for one and attach the pins for another, all in one go. I could not exclude a single child; I had to cater to everyone’s needs. It was interesting that I was working with the very students who also saw me as a ‘teacher’ in their classroom. Naturally, they enjoyed ordering me around! The shouts of ‘Akka# paint’, ‘Akka mixing’, ‘Akka dripping’, ‘Akka finished’, ‘Akka I am waiting for the pins’! – still resound in my ear. As a servant I did not have the burden of judging the work of the children and comparing them to a standard set of norms. Despite my best efforts, the system compels me to have expectations from children and evaluate them. There is often a hurt look when I give negative feedback on written or oral work if it did not fare well with the expected standard. This was not asked of me in the painting session. It came as a relief. I enjoyed letting them be and not imposing my expectations on them. There is an increased sensitivity in me because in the painting room I have witnessed how each child has a different law of being and growth – their Swadharma. * Kolum – Traditional South Indian designs created on the floors/entrances of homes with coloured powder. A task done mostly by daughters and wives of the household. # Akka – Tamil word for elder sister. The children refer to teachers as ‘elder brother’ or ‘elder sister’ rather than the formal Sir/Madam. The author has an academic background in psychology and is interested in working with new ideas which aim at holistic development of children. She has been teaching for nearly 13 years in both rural and urban schools. She can be reached at silence1677@gmail.com.